We exist at a time in the United States that engenders great concern over how our leaders will define “progress” and “growth” in our cities. For much of the 2nd half of the 20th century, urbanists have been focused on making space available to people, advocating for more inclusive and equitable public spaces for all. In Los Angeles, new civic spaces such as Grand Park, Tongva Park, Vista Hermosa, the Los Angeles River Masterplan, and Pershing Square Renew all seek to connect the urban fabric of the city and, in doing so, connect to all populations. This trajectory of opening up spaces to become more public, more inclusive, and more democratic faces an uncertain future. A renewed rhetoric of nationalism and exclusion questions who has a right to the city. In the city, the front line of our democracy lies in our freely accessible spaces. As urbanists, we need to continue to advocate for dynamic, open, and engaging public realms. 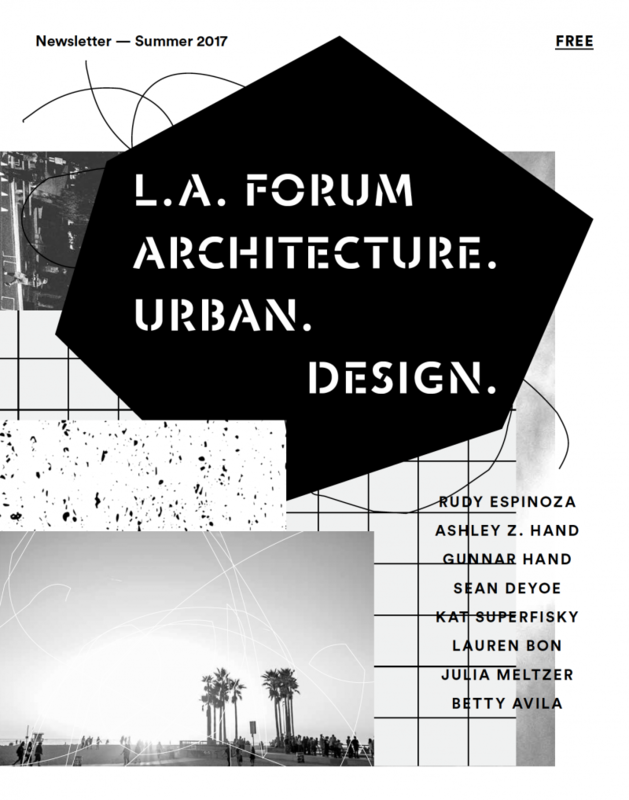 In this issue of the L.A. Forum Newsletter we are exploring the definition of public space in Los Angeles today. In order to best advocate for expanding our public realm, we need to better understand the complex network of public spaces in Los Angeles. In addition to normative models of public space (parks, plazas, and gardens), Los Angeles today exemplifies a public realm that is both symbolic and tangible. Many of these places are technically semi-public, yet have engrained themselves into communities and become vital parts of the cultural life of the city. This blurring of public and private opens up further complexity over how these spaces are controlled, regulated, and protected. In a city where developers become political actors, the users of the city often find themselves in a powerless situation. However, it is the everyday Angelinos of the city that generate the cultural vitality and currency of contemporary Los Angeles. With this newsletter, we will begin to explore some of these questions, in the hope of starting a broader conversation of the future of public space in Los Angeles.